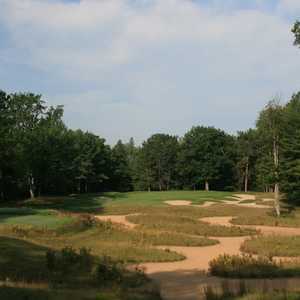 ONAWAY, Mich. -- It's tough to classify a golf course as undiscovered when it consistently fits among the national rankings. But Black Lake Golf Club remains a top facility that goes unnoticed by too many who play golf in northern Michigan. Opened in the spring of 2000, the Rees Jones design deserves a permanent spot in the discussion when talking about the area's best. Black Lake Golf Club has a few things going against it, though. Owned by the United Auto Workers, it carries a misconception among some as a private club open only to those who work for the auto companies. Additionally, it was put up for sale in recent years after Detroit went through its doldrums and the UAW searched for ways to cut costs. August reports from the Detroit News indicate the golf course no longer remains on the market. The location of Black Lake -- one of the rare must-plays east of I-75, which splits through northern Michigan -- also means you're never really "in the neighborhood." Those who make the effort to get here are in for a treat. It's a quiet, peaceful golf course scattered across 300 acres of dense, hardwood forest and marsh, part of the UAW's 1,000 acres of almost entirely natural property. It plays as well as -- if not better than -- the many multi-course resorts in Michigan. The smaller scope of Black Lake Golf Club may explain why service is attentive -- from the bag drop to the 19th hole. And conditions on the golf course rank as good as you'll find in the area. The UAW spared no expense building its summer retreat. Off the golf course, facilities at Black Lake G.C. include a double-sided driving range and nine-hole par-3 course. The clubhouse includes a pro shop and large restaurant that serves breakfast, lunch and dinner. Its lunch menu features just about every possible sandwich. Even the Red Hat Society women's group enjoyed lunch here on the day I visited. And dishes like New York strip and prime rib fill the dinner menu. A rarity for a Michigan golf course, the large waste bunkers have turned into the signature visual at Black Lake. The two largest come on par 3s, the fourth and 14th, but that's not the only time an intimidating but artful collection of sand draws your eyes away from the green. It's part of the reason a round at Black Lake Golf Club feels a touch like playing at Pinehurst. Jones, who designed Pinehurst No. 7, built runoff areas, raised greens, some narrow doglegs and crafty bunkering. The land is a mix of gently rolling forest and wetlands. Or maybe it's just that I played Black Lake on a sunny, humid, Carolina-esque morning. Black Lake Golf Club fits easily into northern Michigan's top 10 plays and perhaps its top five, though it can get lost in the shuffle as one of the few worthy golf courses east of I-75. Bigger pockets of golf sit to the south in Gaylord or west in Petoskey or Traverse City. 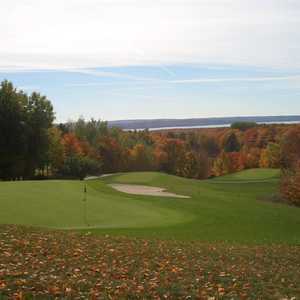 The golf course is part of the Big Fore golf package, which includes Hidden River Golf and Casting Club -- about a 30-minute drive to the west -- as well as Dunmaglas Golf Course and Little Traverse Bay, both more than 60 minutes away by car. To minimize drive time, stay at the Crooked River Lodge in Alanson, closer to the much more golf-rich Petoskey-Harbor Springs-Charlevoix area. 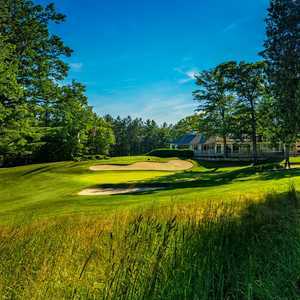 By staying in Gaylord, you're a few minutes away from the its collection of golf courses, plus an hour or less from Black Lake and the attractions of Charlevoix and Petoskey. UAW members receive discounted stay-and-play packages at Black Lake G.C. Nearly 1 million active or retired UAW members never pay the $85 peak season rate -- a bargain in its own right, given Black Lake Golf Club's place among the top golf courses in northern Michigan. Retired members receive 30 percent off, while active members get a 20-percent discount. The discount extends to lodging at the on-site Family Education Center, which offers rooms and two or three bedroom condo units. Rates are $74 to $225, depending on the unit. You may not even know about these privileges. "I'd been working at GM 30 years and didn't know about the stay-and-play package," said Jim, a retired autoworker who now serves as a ranger at Black Lake Golf Club.